Hadrat Sayyid Laʻl Shāh Hamdānī Bilāwalī Naqshbandī Mujaddidī (d.1896) was one of the greatest deputies of Khwājā Muhammad Usmān Dāmānī Naqshbandi Mujaddidi (1828-1897), may Allah sanctify their souls. He was from Dandā Shāh Bilāwal, a town established by his great grandfather Sayyid Shāh Bilāwal Hamdānī who migrated from Hamadān (Iran) and established this new village in Punjab, located between Miānwālī and Chakwāl. He was a true Sayyid, a descendant of the Holy Prophet Muhammad peace be upon him. He was son of Sayyid Jeewan Shāh and had a brother Sayyid Imām Shāh Hamdānī. Hadrat Laʻl Shāh received Islamic education from Hadrat Mawlānā Ahmad Deen Angvī, a renowned scholar and khalīfa of Khwājā Dost Muhammad Qandahārī Naqshbandi (of Mūsā Zaī Sharīf). After completing his education, he stayed with his teacher for fifteen years and taught in the same madrasāh. When his teacher passed away from this world, he left out to seek spiritual training from the shaykh of his teacher Khwājā Dost Muhammad, and did bay’ah on his noble hands in the Naqshbandi tarīqāh. For two years, he received spiritual training and guidance from his shaykh until he passed away in 1284 AH (1868). During the last days, his shaykh who was very ill, asked him to come near and placed his noble hand on his chest and he fell unconscious. When he waked up, he said my chest is now clear of all impurities and rust, and has become bright like a mirror. Later, he renewed his bay’ah with his shaykh’s successor Hazrat Khwājā Muhammad Usmān Dāmānī Naqshbandi and received spiritual Fayd and training from him for many years. He was made a deputy by Khwājā Dāmānī and is considered one of his chief deputies. In the later years of his life, Khwājā Dāmānī remained ill and weak and used to forward new seekers to either Sayyid Laal Shāh or Khwājā Sirāj ad-Dīn for bay’ah. Many pupils of Khwājā Dāmānī were actually formally initiated by Sayyid Laal Shāh, including the great Naqshbandi shaykh Hazrat Pīr Fazal Ali Qureshi (d.1935). He adorned the throne of guidance for almost 30 years and trained hundreds of people in the noble Naqshbandi tariqah, specially people from the Awan tribe. In 1308 AH, he went for Ḥajj and performed the Ḥajj in Makkah and made pilgrimage to the Prophetic Court, upon him be peace and blessings, in Madīnah. He was called to the eternal world at afternoon on Wednesday 27 Sha’bān 1313 AH (12 February 1896), one year before his shaykh Khwājā Muhammad Usmān Dāmānī who passed away on 22 Sha’bān 1314 AH (26/27 January 1897). His disciples then turned to Khwājā Dāmānī and some of them were re-initiated in the Path by Khwājā Sirāj ad-Dīn, the only son and successor of Khwājā Dāmānī. 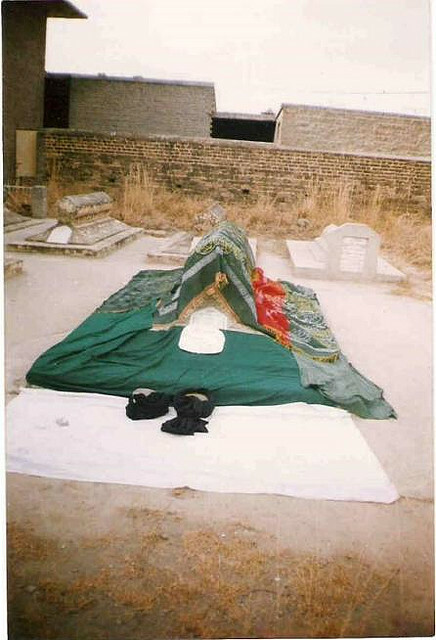 He is buried in Dandā Shāh Bilāwal near the graves of his ancestors. His sacred grave is a source of blessings and a place of pilgrimage by thousands of his followers and lovers. Hazrat Qureshi reports that once an epidemic spread in the area surrounding the khānqāh of Khwājā Dāmānī. When Sayyid Laal Shāh arrived in the village, Hazrat Dāmānī said the epidemic will now end as Shāh sahib has entered the village. So the disease stopped spreading. Once, two persons in the family of Khwājā Dāmānī became very sick while he was on a journey. He asked his assistant to write a letter to home to know the conditions. However, Sayyid Laal Shāh said that there isn’t any need to write a letter as everything is fine back home. He said this from his miraculous vision, and it was confirmed later on. Once Hazrat Dāmānī was invited by a person. With the huge numbers of guests accompanying him, the food was soon finished. Sayyid Laal Shah said that I am restricted by pudency and etiquette, otherwise if I wanted, this hill would have turned into halvā (a sweet). He did not have sons, his lineage has continued through his blessed daughters. This entry was posted in Ahl al-Bayt, Masha'ikh, Pakistan, Punjab and tagged Sayyid. Bookmark the permalink. family.Today his pray with and for the people also with us. Allah bless him. I appreciate this effort, indeed the information provided on this blog is very useful. The Faiz of Musa Zai sharif indeed spread in all corners of Indo-Pak, Afghanistan, Iran and central asia. Hazrat Pir laal shah hamadani was the first sheikh of Hazrat khawaja abu saad ahmed khan(R A) the founder of khanqah Sirajia at kundian sharif mianwali, I am spiritually attached to this khanqah, so for me pir laal shah hamadani is from my mashaikh and i have deep love for him. may Allah bestow his blessings on his grave and the grave of maulana abu sad ahmed khan. As I heard by my younger brother Abu-Saif Syed Shah Abdul Ghani Hamdani and got a chance personally last Ramdan during stay in Karachi last year, its a hope of thirst for the sake of Awliyaaye Karam specially at this time and much more things are available even it need deeply authentications, but more over its a great effort for the Muslims who want real simple straightforward way to find their goal of Hidayah. I pray for all those Muslims who cotributed in this effort. May Allah accept it and make the source of Hudaa for all the Muslims and humanity.